I achieved my Masters in New Media & Digital Culture at the University of Amsterdam. Within media studies I focused my research on the development of demographics online. Specifically de-genderization, or the marketing related process - I found parallel to post democratization - that influences our online and thereby our offline personality while we are randomly surfing the world wide web. Before MTV’s arrival in Canada, the niche for music videos was filled by national television channel MuchMusic. Much, as it is often called, launched in 1984 (Sorensen), remaining a staple on Canadian television for many years. Recently, as younger audiences move online for their media consumption, MuchMusic and similar channels have been experiencing declines in viewership (Quill; Houdt). Because of this shift, their websites are becoming vital ways to reach (and track) their audiences (Houdt). MuchMusic itself began with a strict mandate for music programming, even calling itself an “all-music alternative to MTV” (Brendan). Nevertheless, it has been criticized for following in the footsteps of MTV and shifting its focus away from music in favour of pop culture and other television programming (Quill). Similar to how MTV abbreviated its title from Music Television, the logo on the current-day MuchMusic website simply says Much (MuchMusic). However, unlike MTV, it retains ‘music’ in its official name and web address. Nevertheless, representatives from MuchMusic have expressed their intention to keep the programming focused on music (Sorensen). Although Much does have a more evident music-focus than MTV, this is partly due to content regulations mandated by the Canadian Radio-television Telecommunications Commission (CRTC) (Quill). However, it has been noted that its music programming tends to be grouped together into less popular time slots (Quill). Over the years, MuchMusic has needed to re-strategize several times to remain attractive to its changing audience. Since the 1990s, its broadcaster has been experimenting with spinoff channels to reach fragmenting music audiences that demand niche genres (Leblanc). In 2006, its website experienced a major boost in online video streaming (Strauss). It has been noted that the brand is fighting to reinvent itself in an age where demand for music videos on television is virtually non-existent (Sorensen). Due to rising competition from music and video websites like YouTube, music channels have reacted by making the content of their websites more video-heavy and moving their television program to a more entertainment oriented direction (Quill; YouTube; Dickey & Sullivan). Without viewing the channel, many questions can be raised by simply viewing the website, muchmusic.com. In the screen capture below (from 14 November 2012), it is evident that non-music programming is much more prominent than music programming. Not only are “TV Shows” displayed before “Music Shows,” but the list is almost twice the length (not including music award shows that are still listed in the “TV Shows” list). Similarly, by searching MuchMusic on search engine Google.com, only one of the six site pages listed is related to music and the rest link to television dramas. It was findings like this that lead us to investigate the evolution of MuchMusic.com. Despite MuchMusic’s insistence on its music mandate, there are several indications that this has waned as a result of audience changes. However, instead of studying the changes in audience behaviours and demographics, or the music industry itself, we have chosen MuchMusic’s website as a focus of study. Our primary objects of research were past versions of muchmusic.com, as recorded by Archive.org and made available on their Wayback Machine tool (Archive). We then examined the relationship between television and music-related content based mainly on their position on the home page using the findings of the ‘Golden Triangle’ study (Mediative) to analyse our results. We also examine the evolution from text to multimedia content. Finally, we compared our findings to the current version of the website since the Wayback Machine is lacking archives from the past year. We then narrated and turned the analysis of our research into a short film and published it on YouTube. In conducting this study, we hope to provide data that either supports or dispels criticisms that MuchMusic has abandoned its music roots. Beyond MuchMusic and Canada, we hope that this research can contribute to current research in the fields of audience research, television, music, and cultural studies. 1 What were the main shifts in the interface and the website structure? 2 What does the structuring of content on the website suggest? Before we started our research, we downloaded the necessary tools. Two of our main tools were the Internet Archive Wayback Link Ripper tool from the Digital Methods Initiative (Digital Methods) and the Grab Them All add-on for Firefox (Grab Them All). The Internet Archive Wayback Link Ripper is a tool for web historiography that creates a URL collection of the archived websites. Then, we needed Grab Them All to transform the URLs into screenshots. After this, we installed Java on our computers, to be able to use the free online screenshot software Screenr (Java; Screenr). Screenr allowed us to make motion screenshots, which we needed to show the development of muchmusic.com from 1996 to 2012. For the creation of the actual video, we decided to work with Apple’s built-in video editing software iMovie. To create the video about the interface change between 1996 and 2009, we first entered the URL http://www.muchmusic.com into the Internet Archive Wayback Machine Link Ripper (Digital Methods). The Link Ripper provided us with URLs of archived versions that were collected in the Internet Archive (Archive) from 1996 to 2009. These were then put into a .txt file (Appendix A) in order to use them with the Grab Them All tool (GTA) (Grab Them All). We uploaded the collected URL .txt files (Appendix A) in GTA under the heading “Load Files With URL To Grab”. GTA used the URLs to make screenshots of the archived MuchMusic websites for every URL in the file. We then had an image of the website’s interface for almost every year between 1996 and 2009. The image folder created by GTA included a .csv file listing all of the URLs. We imported this file into Excel and organised them under the following headers: oryg url, browser url, file name, and status. We placed an automated filter on these headers so we could search for the timeout URLs that turned out as blank images. We checked these URLs for these blank images in Firefox to see if they contained any changes important to our research. Since this was not the case, we removed them and ended up with the file attached in Appendix B. Grab Them All provided us with images that were organised by their URL name in which we could read the year, month, day, hour and minute of our crawl. These images we then analysed for changes related to our research questions and documented these changes in our video. After the analysis we made a selection of the websites with the most obvious changes, leaving us with twenty-five in total. Using Adobe Photoshop, we highlighted the changes found in the images (Adobe). With Screenr we then created two motion screenshot versions. One showed the chronological development of the images delivered by GTA, and the other, the edited images that indicate the changes. Finally, we put them all together in iMovie, adding the voiceover and background music. Some of the first notable changes to the website are in regards to its logo, which initially changes places between 1999 and 2000. As we show in the illustrative video, the website name earned a prominent spot on the homepage. The page however was still black and the main focus was on music with music related topics in the static menus from 1999 until 2000. Importantly, between 1999 and 2000, the main focus was still on music on the homepage. In 2001, however, this changed, adding links to TV program listings. A year later, the site refocused on music by adding logos of its pre-paid niche channels, Vibe, Hip Hop and Loud Metal. In 2002 major changes were taking place, because what started with adding a preview of TV programs became a whole new layout on 25th of September, 2002 (Screenshot 1). A drop-down bar of TV programs was added. In June 2004 music earned an inside place in the column again. Before this, most of the TV and video-related content had been music videos but the actual ‘music’ column on the website keeps moving. The homepage on the 15th of August 2004 shows us the first TV show in the banner picture. Namely, American reality show Newlyweds (Screenshot 2), a program following two singers who got married. 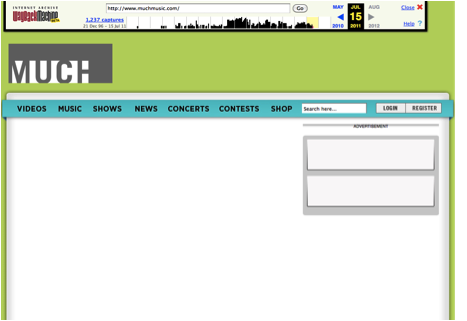 This is also the start of music’s decline on the MuchMusic website. In October 2004, music does no longer appeared as a column, though returning at the end of the month. Note here that TV has never moved as a column. After the 9th of November 2005, the link to music went missing to be found again on 11th January 2006. 2006 was another big year for the website, changing the interface to a white background and black text (Screenshot 3). Even the columns are relocated to the top right of the website. Also, more features of pre-paid music channels are included. In 2007, the biggest change is that the TV show link was pushed to the top left section of the homepage. TV was, however, still in the same area whereas music moved again. During 2008, MuchMusic strengthens the focus on TV and TV programming, even promoting their opponents: MTV and its Video Music Awards. In 2009, the website started looking more like the current version, turning to a cleaner layout and presenting the top bar as a central line (Screenshot 4). In the top bar, TV was again listed before music. An important change in November 2010 was the embedding of social media buttons on the top right, promoting Twitter, Facebook and their own social button. In 2011, the websites interface is almost the same as in the current version from 2012, implementing the new log, which only says Much and having coloured background (Screenshot 5). Comparing the screenshots from 1999 until now we found out that MuchMusic focuses more and more on video content over the years, equally showing music and non-music TV content. The findings are listed above are summarized in an screen cast video, which can be found on the 2012 masters of media’s YouTube channel. Looking back to our research questions, we can draw the following suggestions from the website’s restructuring: The homepage content has shifted focus from music to television, video has become increasingly important, and the channel’s website has become a destination in itself. A study made of Google.com using eye tracking tools by the marketing company Mediative found that if a listing is not in the top left ‘triangle’ of search engine results, it has reduced odds of being seen by the searcher; They call this the ‘Golden Triangle’ (Mediative). Although this study focused on Google as a website, it indicated that viewers tend to focus on the top left section of a website, assuming that they read from left to right. When analyzing a Western website like MuchMusic this can be used for analysis of the structural changes made over time. Assuming that MuchMusic has optimized their website to suit its audience, the placement of TV versus music content is then a sign that the website, just like the TV channel, is losing its focus on music programming. By comparing the archived homepages of muchmusic.com, we can see that the ‘music’ column seems to be getting a different place on the website over the years. At the same time, the ‘TV’ column keeps a prominent spot in the middle of the page. The TV column was originally based on music-related videos, but we now see a shift away from music videos, or music-specific programming. However, due to limitations in the archived pages, this shift may be larger than we think. Throughout the different phases of the website, we can also see an evolution of the role of multimedia. The first page we looked at was almost entirely text-based, with images becoming important later on. From 2006, streaming takes over as the most prominent feature on the page, and today the majority of the page is dedicated to streaming video. Evidently, the use of multimedia has evolved, indicating changes in audience preferences, technology, or both. From these changes, we can see an indication that muchmusic.com may be losing its role as a music destination. It also indicates a shift away from the TV channel itself and towards the website as the audience’s endpoint. This supports the background research pointing to shifts in audience priorities and video viewing habits. In the early years, ‘daily listings’ and ‘current playing show’ were prominent and on top for a long time, but they are now hidden on the right side bar. Instead, most of the main page is now reserved for streaming video, further indicating a shift from the website as support to the channel, but being itself a destination for video content. According to our findings, muchmusic.com had three major changes between 1996 and 2012. The first version was very text heavy, mainly giving supportive information on their television content, which was dominated by music videos. Over the years the content did not only inform about musicians, bands and music anymore but more and more focused on promotion and information about TV-series and entertainment shows. The third major change indicates that videos are now the central content of the website. The videos contain equally music and series, indicating, that the clear focus on music content from the beginning shifted. This matches the general development of MuchMusic, which is criticized for the move from showing music videos to showing entertainment shows on TV (Quill). They argue “We haven’t forsaken videos; we’re just taking them to the places where viewers want to watch them” (Quill). Here, they refer to the general shift from watching videos online, like on YouTube. Still, this is not the case, since the website’s content is not focused on music videos either, but equally promotes videos from TV series and shows. Many of the images delivered by GTA could not be used, because they turned white or were delivered incomplete, due to timeout. We assume the reason for this is, that in the period between 2004 and 2006 a huge amount of the website had been archived, possibly causing a data overload. Another limitation was that the tabs on the top-bar did not show on images after 2004. Hence, we could not tell if the positions of the different topics changed. Further, since the Wayback Machine takes six to twelve months to show an archived page, we were missing screenshots from the last year. We also had difficulty analysing the multimedia content, since the Wayback machine does not support Flash content. This made it impossible to see whether music, television, or entertainment news was in rotation. Further, the captures were unable to save content lower on the page, making it difficult to analyze the columns once streaming video began dominating the screen. Finally, our analysis lacks a comparison to the programming on the actual television channel, its ratings or other changes, as well as a complete comparison with its competition, MTV (or MTV Canada). To build on this research, we would recommend further analysis of MuchMusic itself, and television programming. It would be significant to access website statistics and compare these to the traditional metric of channel ratings. With this data, more conclusions could be drawn regarding audience preferences and how this shaped content. Content analysis should be conducted on MuchMusic’s programming schedule, and the changes in content over the years. Finally, more research on music videos and their audiences would give supportive research not only to the study of MuchMusic, but to other research fields including audience studies, new media, and music to name a few. Archive. The Wayback Machine. The Internet Archive. 12-13 November 2012. Digital Methods. Internet Archive Wayback Machine Link Ripper. 13 November 2012. Grab Them All. Firefox Add on. 13 November 2012. Channel’s Vision. Billboard 105.36 (1993) : 56. Quill, Greg. MuchMusic Shows Its Age. 29 August 2009. The Star. 13 November 2012. Sorensen, Chris. Much(Less)Music. Maclean’s. Business Source Premier. 123.50. Broadcast and Production Journal. 21 January 2008.